Welcome to my blog series ‘Peter Meets’. I am going to ask a number of people in, and throughout the ‘creative field’, the same 16 questions about; art, influences, hopes and other useful facts to know about the movers and shakers in the world where I feel best at home, ‘the creative sector’, ‘the Art World’. For the first episode of ‘Peter meets with the Sweet 16’, I asked Brendan Courtney, T.V presenter, author, content creator, stylist and fashion designer, the sweet 16. Most of us know his handsome face from seeing him on our T.V sets in 1999 with his first show ‘Wonderlust’. Since then he has presented and created many a T.V show such as, ‘The Clothes show’, ‘Off the Rails’ and his latest program 'This Crowded house 'which is currently viewing on R.T.E.2. He has co-created a fashion line with his bizness partner Sonya Lennon, ‘Lennon Courtney’ which is available in Dunnes Stores now. He has also written some best-selling books, such as, ‘Love Your look,’ and ‘Your Best you’. In 2008 I had the absolute pleasure of painting Brendan for my ‘Saint and Sinners’ exhibition. Brendan, thankfully, posed as, Saint Paul the hermit, a saint that’s hold patronage to the world of fashion. Since 2008 I have kept in touch with Brendan and with huge gratification I can call him a pal. 1. Do you have a favorite artist, and what’s your favorite piece by them? That’s like asking someone what’s their fav film, it depends on the genre for me for Pop I love Bansksy and Maser, aesthetically Miro, and Peter Homan, but probably the piece that has excited me the most is Salvador Dalí’s lesser-known España (1938) I LOVE IT! Confederacy of Dunces John Kennedy Toole. 5. I know you are an accomplished, broadcaster and designer, but do you like to dabble in a bit of painting every now and then? sketch all the time, never paint. I read A LOT , so it depends where my head it, but I can be influenced my ANYTHING - currently I am loving Malcolm Gladwell and the theory that we are all just products of our environments – even geniuses. Help older people live more dignified lives and have more choices. That they feel empowered and equal. I had lunch with Madonna, so box ticked, I suppose Dali. It was in 1996, A triptych by a young artist called Adrian Ward from Port-Laois, there was a show in the Ormond Multi media center (not the Morrison hotel) and I bought it for £100 and paid £5 a week , until it was all paid off!! How cool is that ! 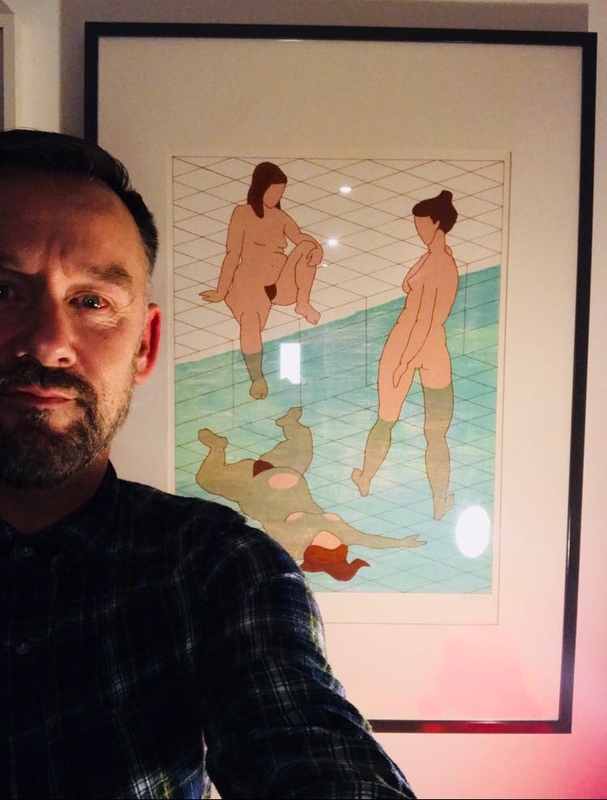 then in Stockholm I bought a stunning graphic with 3 nudes by Swedish Artist Margil Lgung.